2D DIGE image overlays enable easy visual comparison between two protein samples labeled with Cy3 and Cy5 and presented in green and red colors. The more mature B cell type is presented in red color. Triple image overlays enable comparison between the two samples in relative to internal standard sample (Stnd) labeled with Cy2 and presented in blue color. Yellow: Proteins shared between the two samples. Green and red: Unique proteins in the sample. In Ramos samples (Gels 5-7) red indicates up-regulation and green down-regulation in response to anti-IgM stimulation. White: Proteins shared between the three samples (no difference in protein abundance). 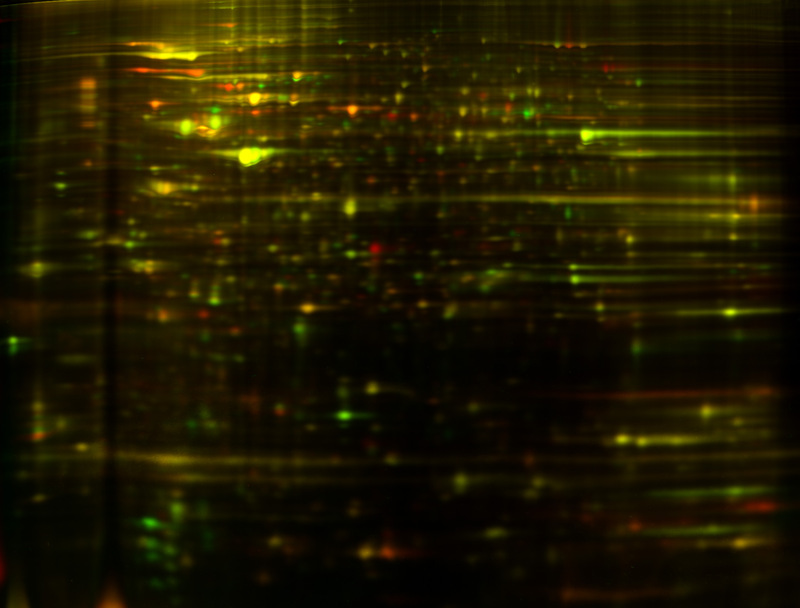 Yellow: Proteins shared between the two samples. Protein abundance is high in the two samples in relative to Stnd. Blue: Protein abundance is negligible in relative to Stnd. Green and red: Unique proteins in the sample. Protein abundance is high in relative to Stnd and to the other sample. Turquoise and purple: Protein abundance is higher/lower in relative to the other sample. Proteins highlighted in red are identified either by PMF or by combining MS and MS/MS spectral data for database searches. Proteins highlighted in blue are identified by comparing their positions on 2D DIGE gel to known proteins in other lymphocyte 2DE databases. Move the mouse pointer over a spot to see the protein name and number referring to Table 1 and Supplementary Tables 2-3. Click on the spot to get UniProt information about the protein. Interactive 2D DIGE map. B cell protein samples labeled with Cy3 and Cy5 and separated in nonlinear pH gradient 3-10. Internal standard is labeled with Cy2 and run on the same gel.